Back in January of 2014 I had the pleasure and privilege to do some traveling through various wine regions of Spain, and I have to say that one of my favorite stops was visiting Bodegas Hermanos de Peciña in Rioja. I’m not sure why it’s taken me so long to finally feature one of their wines on the site, but I guess late is better than never. For those not familiar, La Rioja is about 90 minutes south/southwest of San Sebastian in northern Spain. The appellation is one of the oldest, and most prestigious, growing regions in the world, with written history of winemaking dating back to the late 9th century. For generations of connoisseurs the wines of Rioja were the true essence of Spanish wine, steeped in long standing tradition of wines that were simultaneously rustic and elegant. Times have changed, however, and many wineries in the appellation have pulled away from Rioja’s past and are trying to pave a new way for the future. They have ceased making wines that portray rustic elegance and instead are producing wines that are ripe, lush, dark fruit driven and predominantly raised in new oak. In other words, they are producing wines that they hope can gain interest from consumers that typically lean towards Napa Cabernet, or as we say in the industry, wines that are “new world pandering”. They are making wines with their wallets, rather than their hearts. They are looking for sales, rather than purity. It is truly depressing… Imagine how boring the wine world would be if everything tasted the same. If wineries stopped making wines that are varietally correct and indicative of their region. Wines with a sense of place. Wines that pay homage to the generations of winemakers that came before them. This is where Hermanos de Peciña comes into the picture, and why they are so important. Hermanos de Peciña was founded in 1992 by Pedro Peciña. For over 20 years Pedro was the lead agronomist at one of Rioja’s most storied houses, La Rioja Alta, but he wanted more, both for himself and his family. He wanted something that was his own, something that he could pass on to his children when the time came. So when the opportunity to purchase 50 hectares of vineyard in San Vicente presented itself he did not hesitate. Not only did Pedro want a winery that bore his family name, he wanted to make wines that were representative of what Rioja had always been before the New World scourge had infected the market. Wines of rustic elegance. Wines with a sense of place. He wanted his winery to join the ranks of the traditionalists, which sadly can be counted on two hands, alongside iconic producers like Lopez de Heredia. 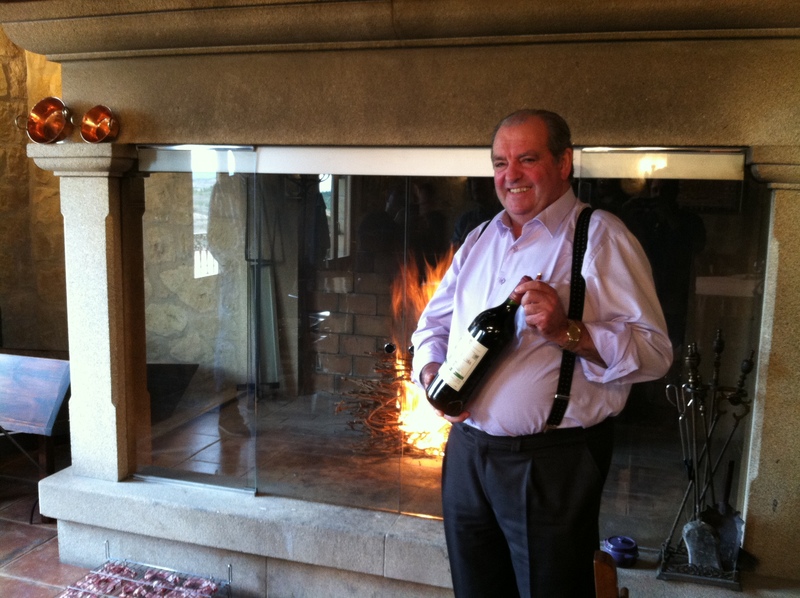 He wanted to show the world what a true wine of Spain tastes like. After the purchase in 1992 it took Pedro five years to get the vineyards (with vine ages upwards of 30 years at that point) to where he wanted them for his wines, and 1997 was the inaugural vintage of Hermanos de Peciña. More often than not it takes wineries a few vintages before they get into stride, but this was not the case with Peciña. Right from that first release they firmly established themselves as one of the top producers in the appellation. During my visit I had the honor of tasting through their entire 1997 lineup (Crianza, Reserva and Gran Reserva) and I was in absolute awe of the wines. Even the Crianza, a bottling that is traditionally meant to be consumed relatively young, was stunning. Fast forward 12 years, to the 2009 vintage, and their Crianza is still exactly that… Stunning! Now before I move forward, let me address a question that I’m sure is nagging at a number of you. No, I am not reviewing a library wine. Yes, 2009 is the current vintage of their Crianza. Not only is it current vintage, but it is newly so, having only hit the United States market within the past two months. But how can this be, most Crianzas available now are 2011 or 2012 vintage, and now some 2013’s are even starting to trickle in!? 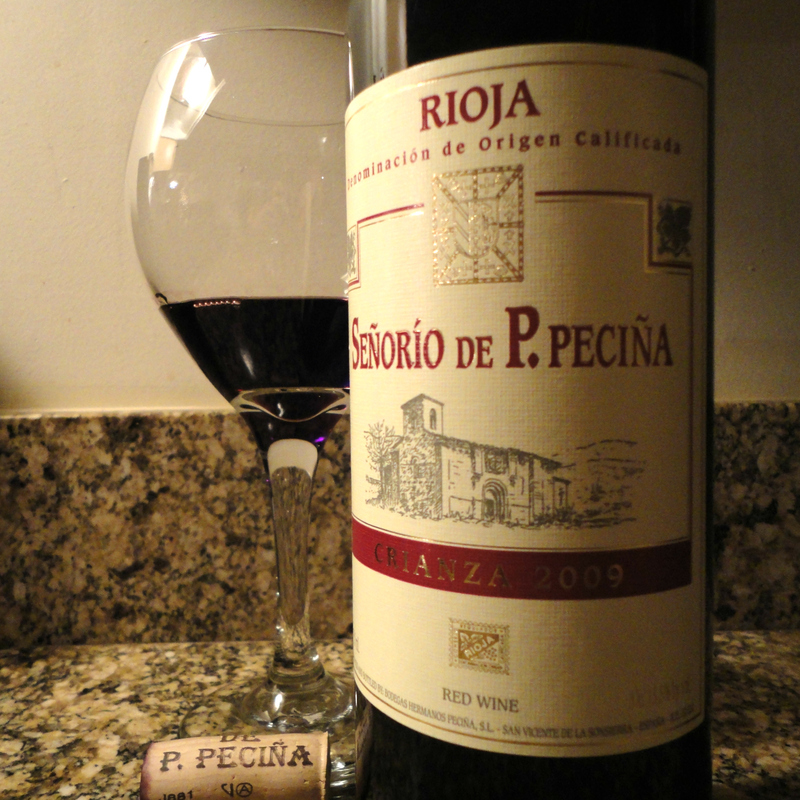 The explanation is simple… Peciña ages all of their wines well beyond designation requirements. To label a wine as “Crianza” it only needs to be aged one year in barrel and an additional six months in bottle before release. Peciña ages their Crianza two years in barrel and an additional two years in bottle before release. Technically they could label this wine as a “Reserva”. In fact, their Crianza ages even longer than is required for the Reserva designation, which is a minimum of three years total aging with at least one of those being in barrel. When I asked them they don’t label their Crianza as Reserva their simple response was “because we have a Reserva”… Oh yeah, and let me point out that their Reserva is aged long enough to be designated as a Gran Reserva! So what does that make their Gran Reserva? Amazing. That’s what it makes their Gran Reserva. Amazing. The Crianza is a blend of 95% Tempranillo, 3% Graciano and 2% Garnacha (as are all of their red wines) aged for two years in neutral American oak, and an additional two years in bottle. In the glass is a medium to full bodied wine of deep garnet hue. The bouquet reveals aromas of black cherry, cassis, fennel frond and subtle potpourri. On the palate are distinct notes of ripe cherry, blackberry and tart bramble fruit, as well as nuances of leather and nutmeg, with beautifully integrated acidity and soft tannins giving balance and backbone. Truly a beautiful wine and an unbelievable value. As far as food pairings go, I strongly recommend relatively simple fare… Stews, braised or roasted beef, lamb, goat or hearty vegetable preparations like lentils or roasted mushroom tarts. With roughly 8,300 cases produced per vintage this wine has moderate market presence, though there are still some regions that haven’t yet been exposed to the brilliance that is Hermanos de Peciña. If that’s the case for where you’re at… well, that’s why we have internet and credit cards. There are plenty of online boutique retailers that will be more than happy to ship you a few bottles, or hell, buy a whole darn case! You’ll thank me later. baby rack of lamb over that indoor bonfire of dried vine branches. Tags: crianza, hermanos de pecina, perfect pairings, perfect pairings at home, rioja, spain, spanish wine, tempranillo, wine. Bookmark the permalink.